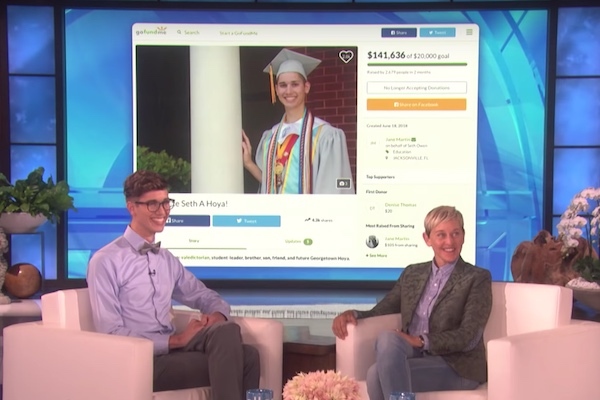 Ellen DeGeneres surprised Seth Owen, the high school valedictorian who was kicked out by his parents for being gay, with a hefty donation. 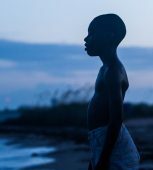 The 18-year-old student from Jacksonville, Fla. recounted to DeGeneres when his father found a picture of him and his first boyfriend on his phone. His parents sent him to conversion therapy in an attempt to change his sexual orientation. “The dangerous part about that is, as a patient, I believed that this health care professional was doing what was best for me,” Owen said. During his senior year in high school, a new pastor preaching anti-LGBT sermons joined his church. “I asked to go to a different church, and they said that I would either have to go with them or move out. And so I decided that day that I had to move out,” Owen said. In June, Owen was accepted into Georgetown University. Jane Martin, one of Owen’s high school teachers, launched a GoFundMe campaign to raise $20,000 for his college education. The fundraiser surpassed the goal and raised $141,636. After he graduates, Owen says he plans to put the remaining funds into a scholarship for students in similar situations. DeGeneres and Cheerios decided to kickstart the scholarship by donating $25,000.